Location: The station was on the south side of Winsor Terrace but that part of the road was lost during the construction of Royal Docks Road in the 1990's, The station site is to the east of Royal Docks Road. Notes: Beckton Gasworks commenced production on 25th November 1870. A single track branch railway to the North Woolwich line was authorised by the Gas Light & Coke Company Act of 1871. The 2 mile branch left the North Woolwich line east of Custom House Station running to a terminus just outside the gasworks. From there the line continued into the works joining a vast internal railway network on the 269 acre site in 1871 with a total of 41 miles of standard gauge track, 32 miles at ground level and 9 miles on a steel viaduct. Freight traffic into the gasworks started on 14th October 1873 and from 17th March 1873 a non-timetabled workmen's service was provided to a station at Beckton close to the entrance to the works on the south side of Winsor Terrace which had been built for gas works employees. From 18th March 1874 it became a public passenger station with the line being leased to the Great Eastern Railway. Although a public station it was intended primarily for the workforce with trains timed to coincide with shift changes. 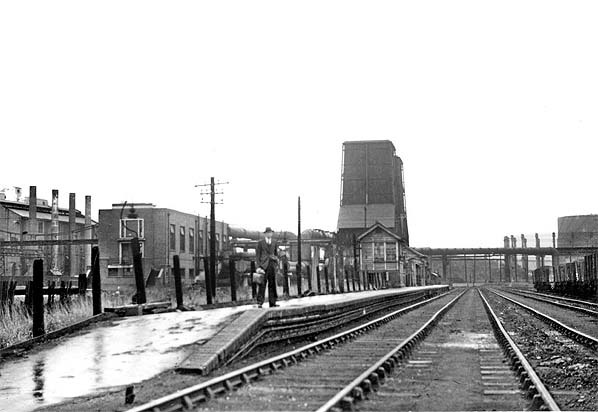 A separate private station named Beckon Gas Works was sited within the works. This is listed in the Railway Clearing House handbook for 1895 but it had gone by 1904. A goods service operated to Beckton but this was withdrawn during March 1930. 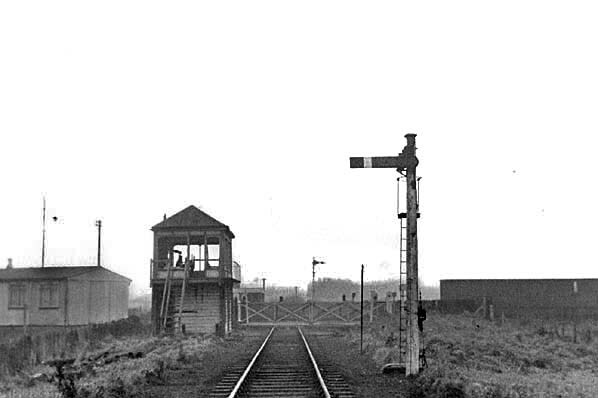 The station had a single platform on the north side of the line with a signal box, waiting shelter and booking office. For much of the time the station was unstaffed. A number of sidings were provided on the south side of the station for marshaling goods trains. During the early 20th century, passenger numbers began to suffer with competition from trams. The opening of the Barking bypass in 1927 led to the introduction of a direct bus service from Stratford which brought a further reduction in ticket sales. The nearby Gallions branch was damaged by German bombing during the early afternoon of 7th September 1940 and Beckton suffered at the same time but the line was repaired and the December 1940 timetable showed one train each way per day. This passenger service was finally withdrawn from the station on 29th December 1940. 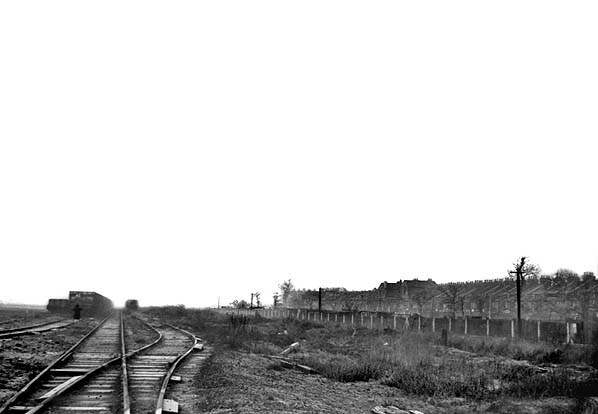 Freight traffic continued to run and new sidings were built to accommodate coal trains as enemy bombing made it difficult to deliver coal by sea. Although the gasworks remained in production post war it was in decline by the mid 1960's. The last coal train arrived at Beckton on 16th April 1969 and production ceased on 16th June 1969 with the final train running into the gas works on 1st June 1970. 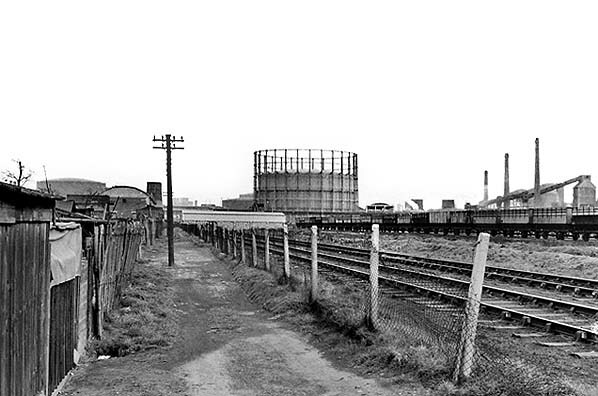 The line was officially closed in February 1971 and all the track was lifted within two years; the gas works has now been demolished and the area redeveloped. 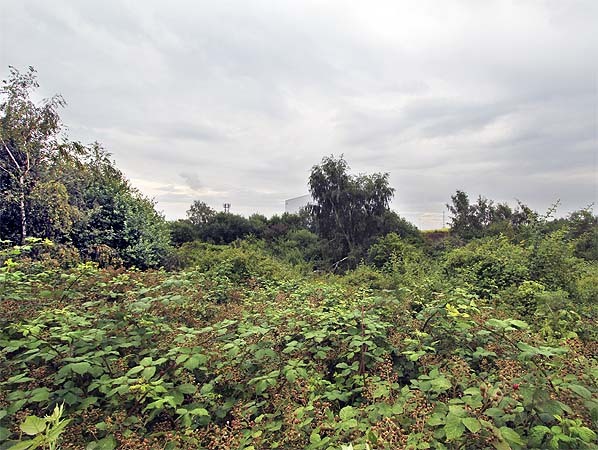 Today, most of the line to Beckton has been taken up and is now a public footpath, known as the 'Beckton Corridor'. A short stretch of the line east of Woolwich Manor Way has been reused as the final part of the Beckton branch of the Docklands Light Railway. Beckton DLR station is located several hundred yards west of Beckton railway station; "eastbound" trains from Gallions Reach loop back round over the old line in the reverse direction, entering the station from the east. Tickets from Michael Stewart. Bradshaw from Nick Catford. 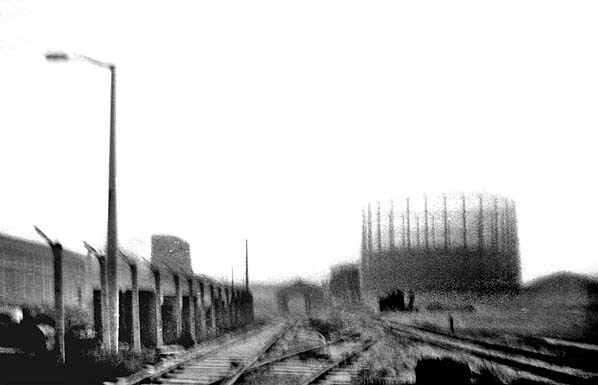 Beckton station looking east towards the gasworks in the 1930's. 1898 1,2500 OS map shows the single platform opposite a small marshalling yard. 1962 1,2500 OS map still shows Becton station even though it has been closed for 22 years. Part of the platform is intact as are the station buildings and signal box. A siding runs into the platform from the east, The track layout around the station has completely changed, one of the lines runs through a shed. 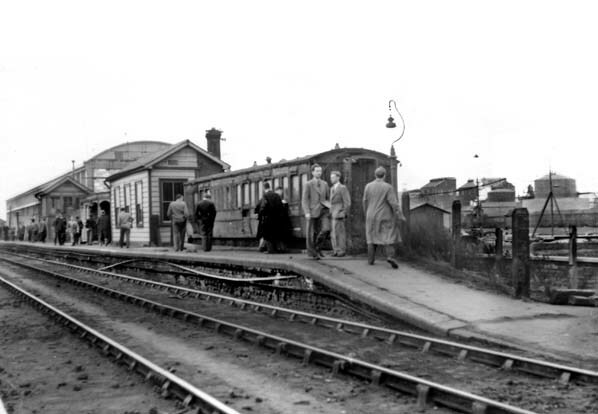 Becton station probably seen during a railtour in the 1950s. The closest building is the booking office. Between that at the signal box there is a small open fronted waiting shelter. R.C.T.S. 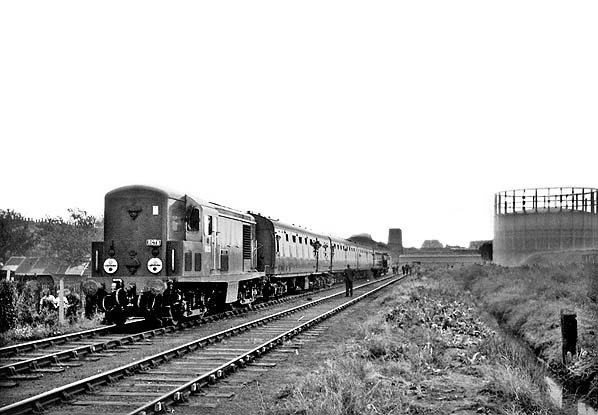 (London Branch) East London No.3 Rail Tour at Beckton on 6 October 1962. Taken from the same position opposite Winsor Terrace as the picture above. This tour was hauled by Class 15 D8236. This loco remained in service until April 1969. 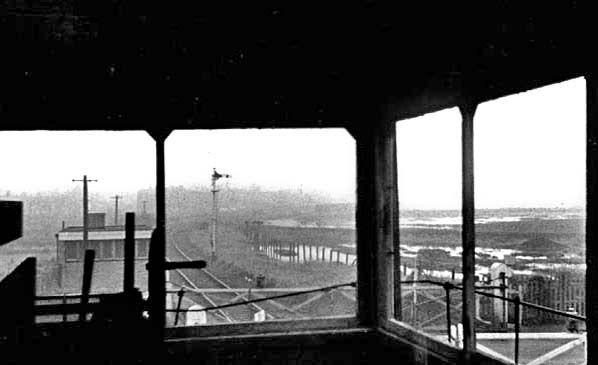 Very poor quality view looking east towards the site of Becton station in November 1967. 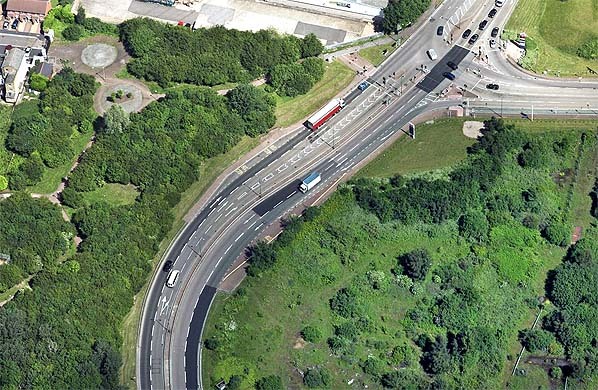 The actual site is out of view almost opposite the shed (seen on the 1962 map above) in the middle distance. Looking west along the Becton branch from the same position as the picture above in November 1967. Winsor Terrace is seen on the right. Aerial view showing the site of Becton station. The truncated end of Winsor Terrace is seen top left . The line ran to the south of Winsor Terrace, roughly across the middle of the picture. The station was on what is now waste ground to the east of Royal Docks Road and south of Armada Way.